Well, pickings are getting slim on the ready made custom Topps cards, so you are going to be graced (or cursed) with this rendition of a 1988 Jackson. 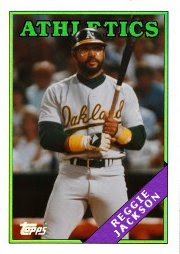 This card was incredibly difficult to make because of the Athletics name, plus I had a heck of a time finding a decent shot of Reg in an A's uniform that didn't come from the 60s-70s. Prime fodder for retro remakes, but I don't think a side-burned laden funky Jackson in a bright yellow uni would look right on an 88 Topps. Maybe would look good on Night Owl's new 75 Topps homage site though. PLUG! Anyways, Jackson was really a non-interest guy for me in my childhood days. My dislike for the AL lead to me rarely following him, even when he was an Angel and a short drive from home. However, I've grown to enjoy Mr. Jackson (I am for reeeaaal), since his retirement. I've enjoyed some of his movie cameos and he actually seems to be a real nice guy and not the trouble maker those Damn Yanks would lead you to believe he was. Also saw him on PBS doing an interview with Bob Gibson (Yes, I am a nerd). Those two guys were intimidating just sitting around the table chatting, let alone on the mound or in the box. On a side note, he has always kind of looked like my Dad, despite the obvious skin tone differences. Reggie's final season was pretty ho-hum for a final bow. The soft AL rules did allow him to play to the ripe age of 41, and gave him his final resting spot of 563 on the dinger chart. Also, I just read he is a cousin of Balco Bonds. Geez, who isn't?